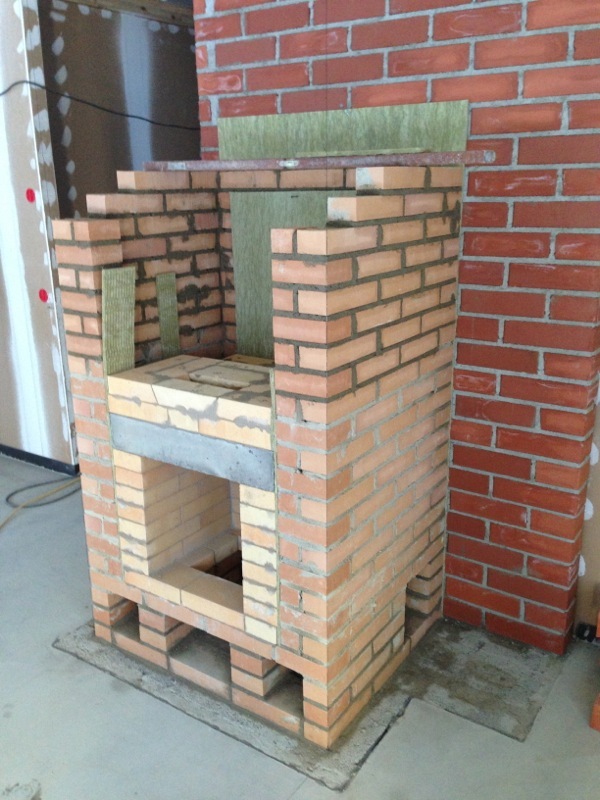 On Thursday, 21st February, the work continued with the frame of the fireplace. The photo above shows the work done before lunch break. Clearly visible is the contrast of fresh (dark/wet) mortar against the light-grey (dry) mortar from two days ago. At this point, the frame was complete up to layer 21, and layers 22-23 were in the making. But then it was time to begin work on the heart of the fireplace, using fireproof bricks and special fireproof mortar. In the photo, layers 5-8 of the heart were completed (layer numbers always start from the floor). 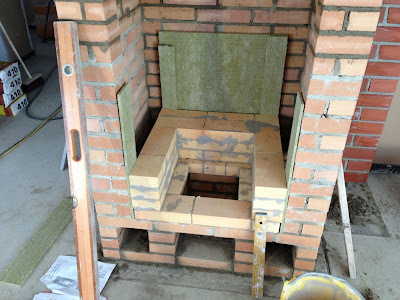 A close-up of the fireplace shows a hole in the middle, which will be covered by a grille through which ash can fall down. The ash can be cleaned up through the hatch below. Work rapidly progressed after lunch and soon layers 9 to 15 were installed. The empty cavity under the concrete bar is the normal fireplace. Further up, there will be another fire, which will function as an oven. 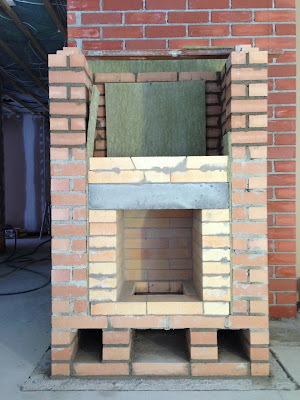 The slit, which is just visible in the photo on the top layer, will be used to drop the ashes and embers from the oven into the fireplace before preparing food or baking. Another view from the front. 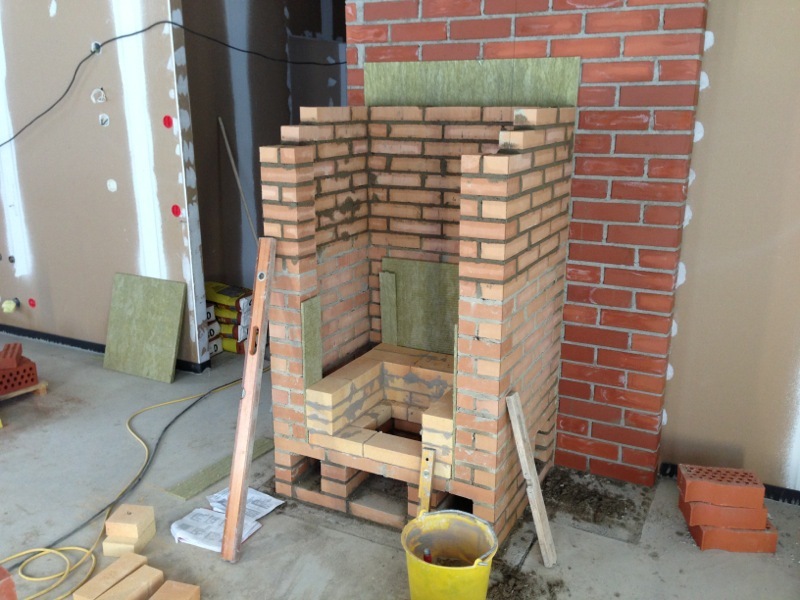 The structure will eventually be encased in another layer of bricks, which will then be covered with plaster and painted. The doors will be black cast iron with glass windows, and there'll be black tiles around the lower fireplace. 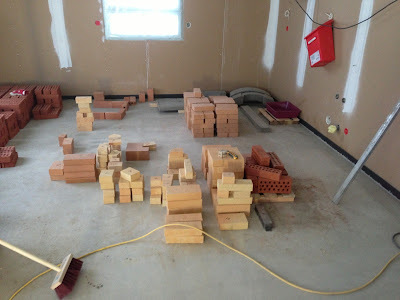 Again, the number of bricks scattered around the kitchen is on the decline – which is just as well, since at some point the kitchen furniture needs to be installed.